​Dom Forys nearly reached his goal of earning All-American status over the weekend, but the sophomore wrestler came up just one win short. While Forys still put together a strong showing at the NCAA Wrestling Championships Friday, his performance reflected the Pitt wrestling team’s up-and-down season — admirable, but just missing its lofty goals. Still, Forys said if the narrow loss accomplished anything, it gave him a clear mindset for his junior campaign after capping off a 25-3 season. “It was a success in that I learned a lot of things from the weekend that I can apply to the coming offseason, for next season. I have a motivation now, there are things I can get better at. I need to set my goal [next year] to be a national champ,” Forys, who wrestles at 133 pounds, said. He added that the loss helped illustrate how close he is to achieving his dream. “Now I know there’s just a tiny string separating me from being the top guy,” Forys said. 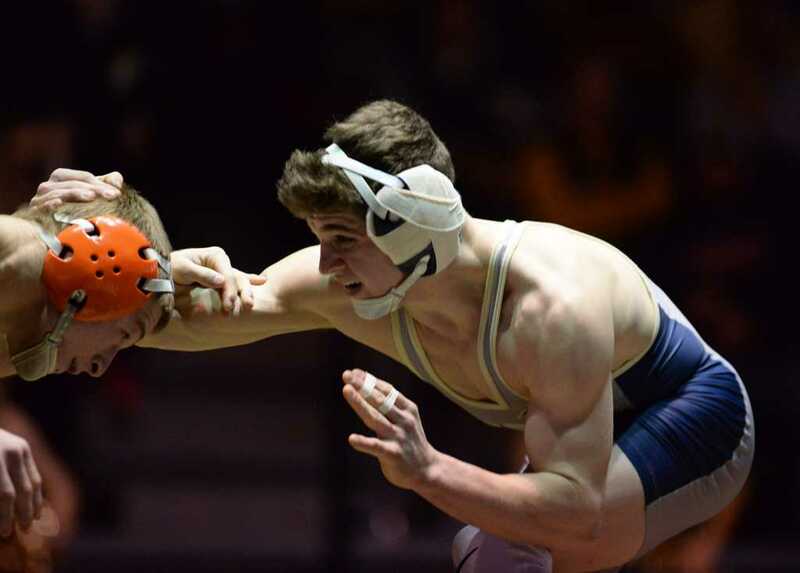 For Pitt as a team, nationals will again be the goal, but it will want to make a bigger splash, as only Forys and freshman LJ Bentley won a bout this year. The Panthers finished the season 10-7 overall, with a 2-3 mark in ACC competition. Pitt started off its season hot, defeating No. 15 University of Wisconsin Dec. 12, and sweeping Pitt Duals Jan. 9. But the team ran into trouble facing a gauntlet of nationally ranked opponents, dropping six of its last seven dual matches. Between Jan. 17 and Feb. 5, Pitt faced — and lost to — three top-10 teams in Oklahoma State University, North Carolina State University and Virginia Tech. Pitt head coach Jason Peters said part of the midseason lull came from starting several freshmen out of necessity, such as Bentley and TeShan Campbell. The team will work on its strength and conditioning, Peters said, to maintain early season success next year. On Feb. 19, though, the team returned to the Fitzgerald Field House and delivered another signature win, beating No. 20 University of Virginia, 19-17. The Panthers finished sixth in the ACC Wrestling Championships before sending six wrestlers to the NCAA Championships. While Forys advanced the furthest, senior Nick Bonaccorsi notched his third NCAA Championship appearance before dropping his two bouts. While he didn’t reach his goal of becoming an All-American in his final year, Bonaccorsi said he was still fairly happy with the season and his Pitt career. Bonaccorsi is one of three seniors on the team. He finished his Pitt career with a 72-46 record, while Ronnie Garbinsky finished 62-50 and Matt Patrick 14-34. Graduating this semester, Bonaccorsi said he will enter a Pittsburgh police academy in August. But he won’t leave the mat forever, and said he plans to help train his high school brother to wrestle competitively in college. Pitt will miss Bonaccorsi’s experience as a senior, but Forys said he is ready to assume full leadership of the team. Forys said the team has gotten a taste of success, but next year he wants to lead Pitt even further. Bonaccorsi said while those freshmen, such as Bentley and Campbell, had to find their footing this year, the experience will only benefit them in their Pitt careers. Both finished their first season with an 18-10 record.